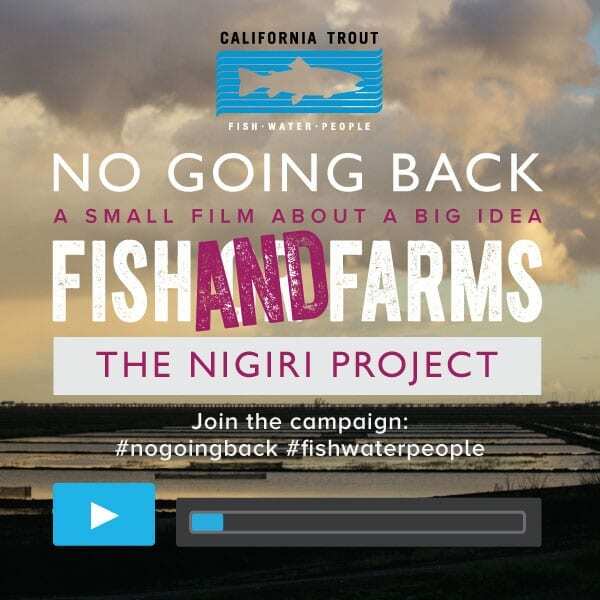 News | Page 98 of 101 | California Trout, Inc. The McCloud River has been quite fishable so far this spring, but an end to the unseasonably cool springtime weather in the northern end of the state means the record snowpack is melting and flows are on their way up — including on the McCloud River. As you may be aware, McCloud Dam has been spilling approximately 150 to 300 cubic feet per second (cfs) for past several weeks. PG&E has been taking careful steps to manage the spill flow and increasing inflow into McCloud Reservoir by monitoring the reservoir level, maintaining the water surface elevation in Iron Canyon and McCloud Reservoirs, and diverting water through James B. Black Powerhouse to maintain the maximum amount of storage capacity. Based on the current snowpack condition, increasing air temperature, and increasing inflow conditions into McCloud Reservoir, PG&E anticipates that the spill magnitude at McCloud Dam will continue to increase steadily over the next several days, and possibly weeks depending on the long term weather trend. Click here for the most current flow conditions in the Lower McCloud River below the dam. Click here or the most current flow conditions in the Lower McCloud River at Ah-Di-Na. PG&E is observing rapidly increasing inflows into Lake Britton and as a result anticipates that Pit 3 Dam will spill. PG&E has taken careful steps to manage the increasing inflow into Lake Britton by monitoring reservoir level, maintaining a low water surface elevation, and has increased water diversion through Pit 3 and Pit 4 powerhouses to maintain appropriate storage capacity. The increased water diversion at Pit 3 and Pit 4 powerhouses will result in spill conditions today in the Pit 5 bypass reach. The current flow release from Pit 5 Dam is approximately 500 cfs, which will increase over the course of today to approximately 1000 cfs to 1500 cfs. As inflow to Lake Britton continues to increase over the coming days, PG&E will increase the instream flow release at Pit 3 Dam from about 300 cfs to 540 cfs. Shortly after the instream flow in the Pit 3 reach is increased, Pit 4 dam will begin to spill approximately 50 to 150 cfs. Subsequent inflow increases into Lake Britton will spill over the Pit 3 Dam at a natural rate of increase, and will affect the downstream spill magnitude in the Pit 4 and Pit 5 reaches. At this time PG&E is unable to accurately provide an estimate of the anticipated spill magnitude in the Pit 3 and Pit 4 reaches, as inflow to Lake Britton continues to increase daily and record snow pack remains in the Warner Mountain Rage. Following the snow melt runoff period, which may extend for several weeks, PG&E will allow the spill flows to recede naturally to the license required seasonal minimum instream flow. 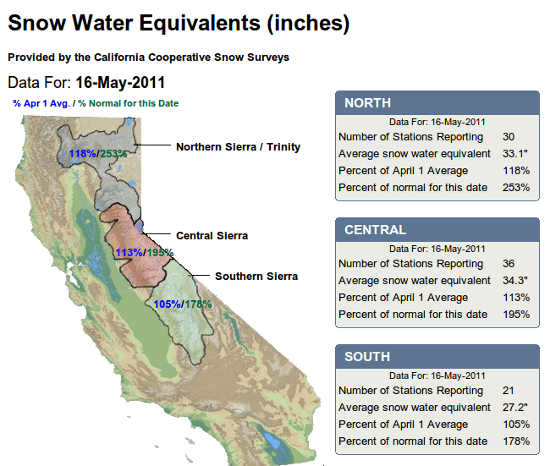 California’s snowpack remains stubbornly opposed to melting, and the latest figures are startling; the Northern Sierra snowpack/wetpack is at 465% of normal for this time of year (May 31). What’s it mean? It suggests California’s fly fishermen will be seeing high runoff flows far later than normal — and that the flows on many rivers now are only precursors of what’s to come. Couple a record snowpack (170% of normal at the end of the April 1 snow year) with a very cold, wet spring, and you have a situation where the snowpack is melting very slowly. In fact, recent cold storms have added to the snowpack at higher altitudes. With rivers like the Upper Sacramento — which often features flows in excess of 10,000 cfs this time of year — still flowing around 2000 cfs, it’s clear that anglers better fish now, because once high flows arrive, they’ll stay high for some time. 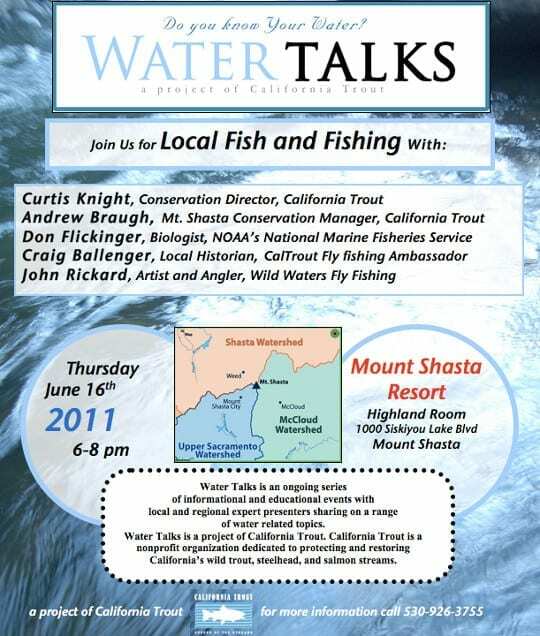 Join us for our June 16 Water Talk (another in our series) — this one focused on fish and fishing. San Francisquito Creek represents prime habitat for the SF Bay Area’s few remaining endangered steelhead trout. Stanford University is avoiding bringing Searsville Dam into compliance with the Endangered Species Act and continues to threaten the survival of this iconic fish. That’s why we’re asking you to tell Stanford and federal agencies to live up to the law. Stanford University’s antiquated Searsville Dam blocks approximately 20 miles of historic habitat for federally protected steelhead trout on San Francisquito Creek. Stanford wants to exclude Searsville Dam from the permitting process normally required for new construction and ongoing endangered species impact. In addition to blocking access for steelhead spawning and rearing, Searsville Dam dewaters the creek, degrades downstream water quality and habitat, which is designated “critical habitat” for steelhead, and helps spread non-native predatory species in the San Francisquito Creek watershed. Rather than include Searsville Dam in the Habitat Conservation Plan (where landowners receive “incidental take” permits in return for negotiated species protections), Stanford wants to exclude the operation of Searsville Dam from this critical process, leaving them free to harm steelhead populations without any real oversight and out of compliance with multiple state and federal laws. We do not believe Stanford can unilaterally decide to avoid their legal requirements at Searsville Dam while continuing to seek coverage of their campus water supply system, of which Searsville Dam is an integral component. We are encouraged that Stanford recognizes the criticality of this issue with the recent formation of a university blue-ribbon panel to address Searsville. It is our belief, however, that this internal approach does not relieve them of their legal responsibilities. Make Stanford take responsibility for Searsville Dam; send a polite but direct email asking federal resource agencies to hold off releasing their Environmental Impact Study for Stanford’s flawed Habitat Conservation Plan until Stanford acknowledges and adequately addresses the impacts of Searsville Dam and their entire water diversion system on federally protected steelhead trout. Also, insist that a revised and corrected Habitat Conservation Plan and supplemental draft Environmental Impact Statement be released for public review and commentary. Update: Since we first posted this article and screencast, the McCloud Dam relicensing project has moved forward, albeit slowly. Fortunately, the flow regime we discussed below remains the preferred alternative, and the relicensing process is now in the hands of the State Water Resources Control Board for review. But there is a twist; federal agencies are considering the reintroduction of Chinook salmon into the McCloud and Upper Sacramento Rivers (via “trap and truck” methods). How this would affect relicensing and the preferred flow regime is unclear, especially as the reintroducion remains a fairly nebulous project. Click here to read CalTrout and Trout Unlimited’s joint comments to the Water Board regarding this issue and how it affects the FERC relicensing. In this short, informative screencast, CalTrout Conservation Director Curtis Knight uses hydrographs (generated from data collected in prior years) to explain the benefits of CalTrout’s proposed new flow regime for the McCloud Dam Hydro Relicensing project (which controls flows in the Lower McCloud). The McCloud River is one of California’s most popular (and perhaps one of the world’s most beautiful), and McCloud Dam — which controls much of the flow down the lower McCloud — is undergoing a relicensing. The flow regime established here will remain in place for 40-50 years, so it’s important that it’s done correctly. There have been a lot of questions asked about the McCloud relicensing, and we think using actual flow data to contrast and compare the old and new flow regimes — and explain the benefits of the new plan — remains the best way to address those concerns and counter some of the rumors and misinformation finding their way to fishermen. For more information, view the screencast, or read our previously posted article on the McCloud Dam relicensing. California’s fly fishermen are facing a record snowpack and unseasonably cold spring weather — and a sizable spring runoff even that might render a lot of streams and rivers unfishable well into July. In fact, in the Northern Sierra region — which saw a snowpack of 170% of normal on April 1 — the snowpack/waterpack rating is 253% of normal for this time of the year. During this year’s extended runoff period, anglers will look to reservoirs, tailwaters and other locations featuring easily fishable, controlled flows. CalTrout is saddened to learn of the passing of Byron Leydecker, who — two decades ago — become stuck in the mud while fishing the Trinity River. Angered by the damage to the river caused by diversions and an ill-planned restoration project, Leydecker formed the Friends of the Trinity River. Over the course of nearly two decades, the Friends of the Trinity River was instrumental in convincing legislators to restore some of the Trinity’s historic flows (diverted for agricultural use), and in recent years, the Trinity has once become one of California’s strongest steelhead fisheries. In January, Mr. Leydecker was honored for his efforts by the Humboldt County Board of Supervisors, the U.S. House of Representatives and the California Legislature. He was also named an honorary citizen of Trinity County. 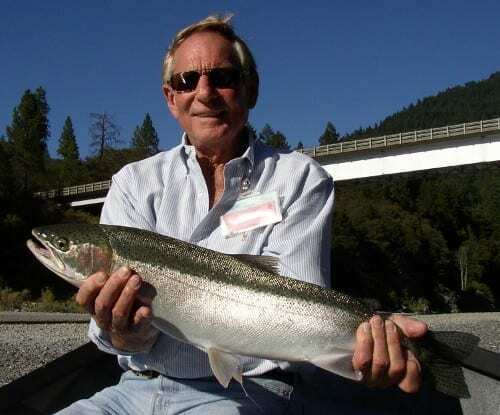 Tom Weseloh, who was the regional manager of California Trout in 1992, said he also received a call from Leydecker after the banker’s mud-spoiled fishing trip, but didn’t think much of it at the time. Over the coming years, Weseloh came to know Leydecker better than most, serving next to him on the Friends of the Trinity River board of directors. “When they weren’t racing around the Dixie’s three decks or staring down into the blue through the glass bottom, the students shuffled through workshops on water conservation, wildlife and forest management taught by representatives from ten different agencies.